Sketchy. Wiry. Paranoid. Hot temper, "tuff" & not to be trusted. He drives a Subaru Brat with 2 seats in the back. The inside of the vehicle is completely filled with useless junk: broken tools, empty cans, random pieces of paper with "contacts" on them, etc. The Crystal Methullet typically does not have a job. If they do, it's usually at a convenience store or a shady auto parts store where they appear to be right at home. These jobs (or "gigs" as they refer to them), tend to be temporary and usually end in termination due to theft. *A free shirt indicates he donated blood for a cookie and five bucks. Anything to help support the habit. -Cut out sleeve/neck shirt exposing faded military tattoos. -Holding an empty water bottle and leaning against something, creating an intimidating stance. 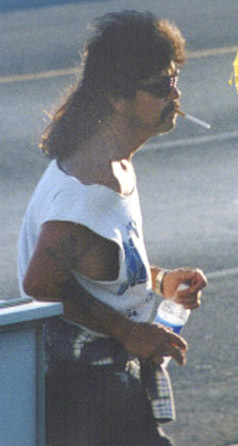 Hand musculature has morphed into a strong claw-like grip over many years of evmullution due to habitual cigarette smoking while holding various plastic bottles (see above). -- Note: This right handed specimen appears agitated as the middle digit is slightly flexed, or in a "flipping the bird" position. This usually is a precursor to heavy aggression and blatant cruelty to all animals, big and small. A Classic example of "Business on top, Party out back." The short part says, "Look at me, I can conform to the man. ", while the back says, "Suckers!" 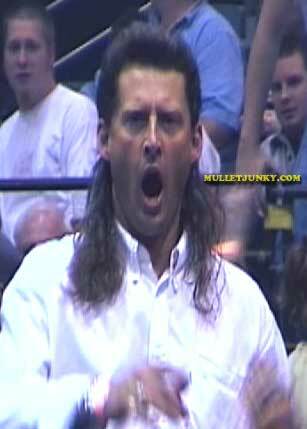 Biz mullet works in the shadiest of corporations and often likes to add a pretend zero to the end of his salary. * Look for him on the commute home, blaring Bob Seger, with the top down in his early 90's canary yellow Mazda Miata. The Biz Mullet may work at some companies, but probably not at a company where employees routinely deal with the public like Titlemax. Do people really want to get their Titlemax loan from a guy who looks like this? 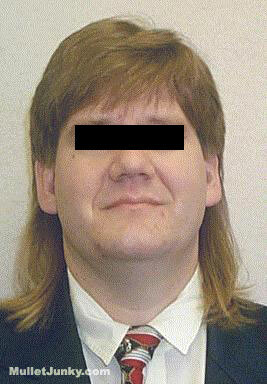 2-27-03 -- This guy just saw himself on the site and wanted me to cover up his identity--Hence the black bar. 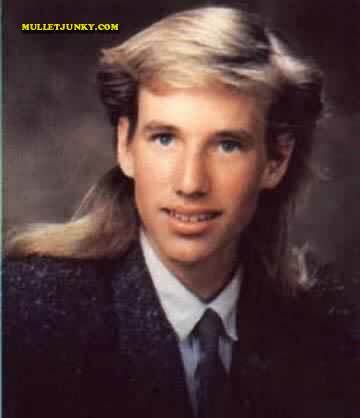 Although my mullet hunting has lead me to many far-reaching expeditions, I have yet to adequately ponder the spiritual side of the mullet. 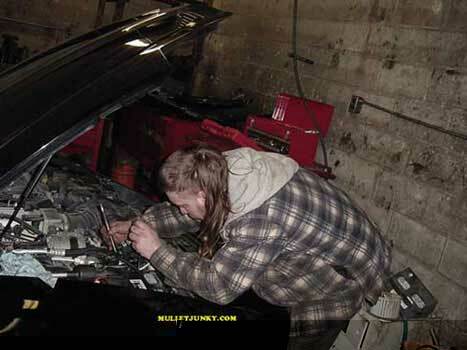 This ignorance can sometimes limit my full mullderstanding of the mullet. I am a Westerner, and my knowledge of the Eastern world/philosophy is limited to Eastern stereotypes such as this deceptive and cunning past-sell-date-canned-goods swindler on the left. Perhaps this is only wishful thinking, but I envision that there is a mystical and hidden region of Mesopotamia filled with a mulltitude of Mulldle Easterners, rich in Muslim folklore. 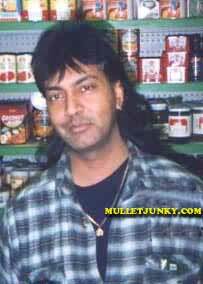 The mullet world is occasionally blessed with a species that likes to emulate nature. "Ricky" took a trip to Niagara Falls when he was in grammar school. Since then, he has tried to replicate the sheer volume and majestic brilliance of one of our nation's most precious treasures directly into his mullet. Ricky definitely succeeded. 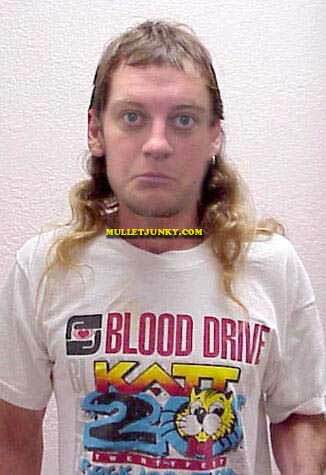 Copyright © MulletJunky.com. All rights reserved.